By undercutting competitors Amazon hopes to gain market share — fast. Amazon intends to sell the Kindle in Brazil for R$199 (US$115) when it begins operations in the country later this year. The company is also considering selling the Kindle for as low as R$149 in a move to gain market share, according to people familiar with the negotiations being done with the company. To reach that price, however, remains a big challenge in a country with high taxes and, in general, very high operating expenses. With a price of R$199 — no matter what the device — Amazon would have the cheapest e-reader available in the Brazilian market, one priced less than half of some Sony readers and well below the R$799 charged for the locally produced Positivo Alfa e-reader. It is also cheaper than what it costs a Brazilian to purchase Kindle from Amazon in US — around US$255 for the cheapest version, once import taxes duties are added. Amazon is working to open its Brazilian operation by the second quarter of this year, between June and July. It is negotiating with local publishers to sell e-books and the first deals with large publishers are expected to be finalized between March and April. According to numbers compiled from a survey by the Brazilian company Simplissimo in January, an estimated total of 11,000 e-book titles are available in Portuguese in Brazil. 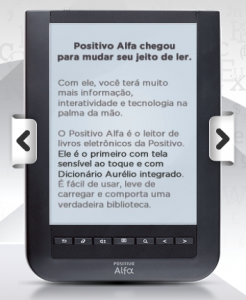 At present, Amazon offers approximately 3,800 e-books in Portuguese on its US site — a little more than half the number offered by largest e-book store operating in Brazil, Gato Sabido, with 7,300 titles, followed by Saraiva, with 6,000 titles. It is widely anticipated that Amazon’s arrival will stimulate more publishers to convert backlist and frontlist titles to digital for sale, giving a boost to the overall figures. According to people familiar with the company’s plans, Amazon intends to launch its Brazilian operation with a catalog of e-book titles comparable to those of its competitors. By way of comparison, Amazon launched its Kindle store in Italy and Spain last December, offering 16,000 and 22,000 titles, respectively. Amazon is also known to be exploring the opportunity to sell print titles, though it faces many obstacles, including designing a delivery system that will comply with the company’s standard business model of offering low prices and fast, reliable delivery. DISCUSS: Looking for More Brazilian Publishing News in English?